The Tech women’s tennis team completed their regular season home schedule at the Ken Byers Tennis Complex over the last weekend. The Jackets lost a close 4-3 decision to the No. 17 ranked Virginia Cavaliers on Saturday, but wrapped up their weekend with a 4-0 sweep of the Virginia Tech Hokies on Senior Day. On Saturday, the Jackets dropped a hard fought decision to the Cavaliers. Virginia took the doubles point by winning two of the three doubles matches to take an early lead. Tech came back to tie it as junior Muriel Wacker won her singles match 6-1, 6-1 against Virginia’s Erin Vierra. A 7-5, 6-2 win by Tech freshman Kendal Woodard gave the Jackets a 2-1 lead. Two wins by the Cavaliers and a 6-3, 6-3 win by Tech freshman Megan Kurey left the score leveled at three with the deciding match on court one. Senior Elizabeth Kilborn fought hard against Virginia’s Julia Elbaba, ranked No. 11 in the country. Kilborn raced out to a 6-1 first set, but Elbaba fought back to win the second set 6-3. Elbaba took a 4-0 lead in the third set before Kilborn edged back with two straight games. However, Elbaba would finish off the last two games to take the three set match 1-6, 6-3, 6-2 and give the Cavaliers a 4-3 victory over the Jackets. Sunday featured the Jackets against the Virginia Tech Hokies on Senior Day. 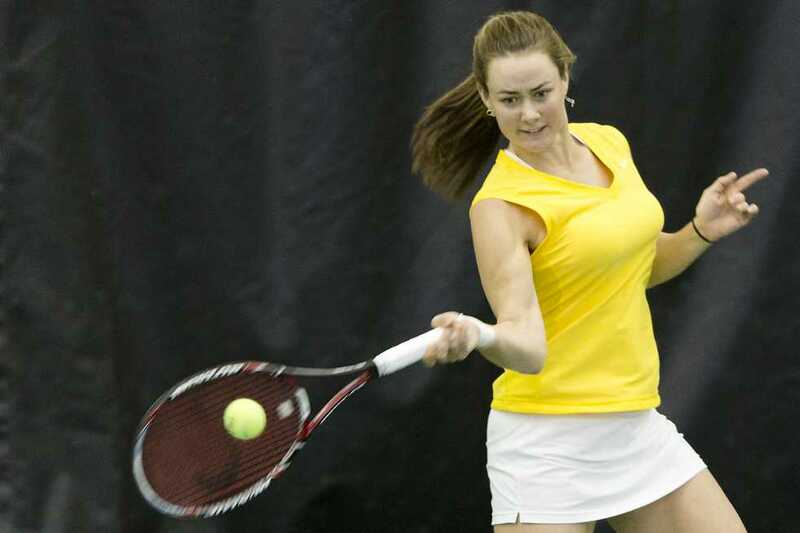 The star of the day for the Jackets was, fittingly, Kilborn, the only senior on the 2013 women’s tennis team. Kilborn and Wacker won their doubles match 8-3 to clinch the doubles point for Tech. It was Kilborn’s thirteenth doubles win of the season, which puts her at 81 on her career and tied for sixth most all-time at Tech. Kurey dominated in her 6-0, 6-3 victory. An easy 6-2, 6-0 by Wacker was her seventh straight victory and put Tech up 3-0 against the Hokies. The Jackets will travel for a match against Wake Forest on April 20 before wrapping up their regular season schedule with a match against North Carolina State on April 21. After that, it’s the 2013 ACC Championships from April 25-28 in North Carolina.